Yes, our site is “officially” launched! Launch Week starts with an interview with Dr. Jeanne Taylor, a Santa Cruz chiropractor. Jeanne is a member of the Gold Standard Chorus, the Santa Cruz chapter of the Barbershop Harmony Society, and chairperson for Sing For Your Life, an annual fundraiser for local area high schools’ music departments. In the interest of full disclosure, this writer is a member of the Gold Standard Chorus, and in fact her participation with a chorus quartet as tenor and spokesperson at KSCO radio a few weeks ago was the inspiration for Bay Area Non-Profit News.So it’s a natural that the chorus and Sing For Your Life would be our first featured non-profit. Headlined this year by five high school choirs, Sing For Your Life has a 15-year history of raising awareness of and money for local high school choirs. 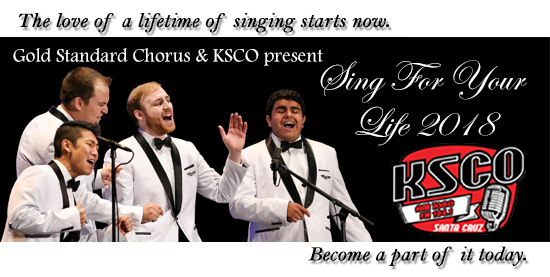 To date, Sing For Your Life has raised more than $70,000 distributed among the participating choirs. Checks from each school’s ticket sales, with the addition of any monies raised by the chorus in additional ticket sales and sponsorships left after expense are paid, are distributed to each school’s choir director by members of the Gold Standard Chorus. The amount distributed can range anywhere from a few hundred dollars to more than a thousand dollars. In addition to Sing For Your Life, the Gold Standard Chorus awards an annual scholarship to a local high school senior.. The Ken Brosius Memorial Scholarship is awarded to a high school senior in Santa Cruz County who intends to continue their education in the music field, as teachers, performers, or other music professions. Funds for the scholarship are raised through raffles at all Gold Standard Chorus shows. Each year, Sing For Your Life brings in a youthful barbershop quartet from the Barbershop Harmony Society, and this year is no exception. Flightline is making their second appearance at Sing For Your Life, having headlined in 2015 right after becoming the Far Western District Champions, and they’re now the 2017 Barbershop Harmony Society’s International Youth Quartet champs! In case you need more encouragement to attend Sing For Your Life this year, here’s a taste of Flightline for you!